If you want to use ODBC with InterSystems IRIS™ Data Platform, this document provides an introduction to how to set it up. InterSystems provides a fully compliant (ODBC 3.5) ODBC driver, which you can use to access an InterSystems IRIS database via ODBC. The driver is installed by default when you install InterSystems IRIS. In order to start using ODBC with InterSystems IRIS, you simply need to configure the driver on your InterSystems IRIS instance. This First Look document provides an overview of that process. If you are not already familiar with ODBC, see the links in the Learn More section at the end of this document for further information. This section describes how to create a DSN for an InterSystems IRIS database on Windows. The instructions in this section assume that you have the InterSystems ODBC driver installed. By default, the standard InterSystems IRIS installation process installs the driver, so unless you performed a custom installation, the driver should be present on your instance. On the User DSN tab, select Add. Select InterSystems ODBC and click Finish. 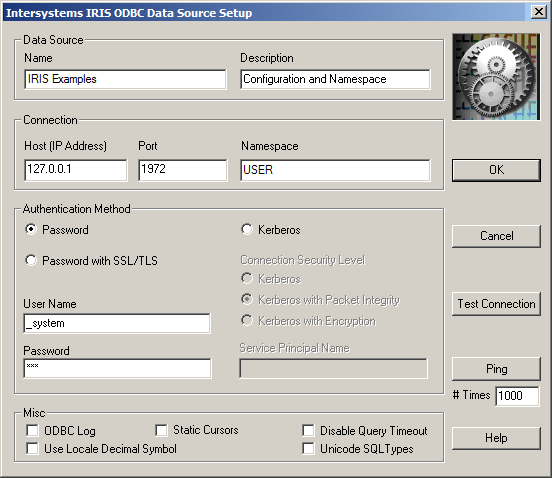 The DSN is created, and the InterSystems ODBC Data Source Setup dialog box is shown. Enter a name and description for the DSN. Enter the IP address, port number, and namespace corresponding to the InterSystems IRIS database that this DSN represents. Select an authentication method, and enter or select other security information as appropriate for the InterSystems IRIS instance. Select the Test Connection button to test that your setup is correct. If the connection test was successful, congratulations! You have finished setting up your InterSystems IRIS database to use ODBC. Now you can modify your ODBC-aware applications to use the DSN that you just created. If you prefer to use a file DSN, see the “Using File DSNs and DSN-less Connections” chapter in the Using the InterSystems ODBC Driver guide for instructions. InterSystems IRIS also supports ODBC on UNIX®; for details, see the “Using an InterSystems Database as an ODBC Data Source on UNIX®” chapter in the Using the InterSystems ODBC Driver guide.